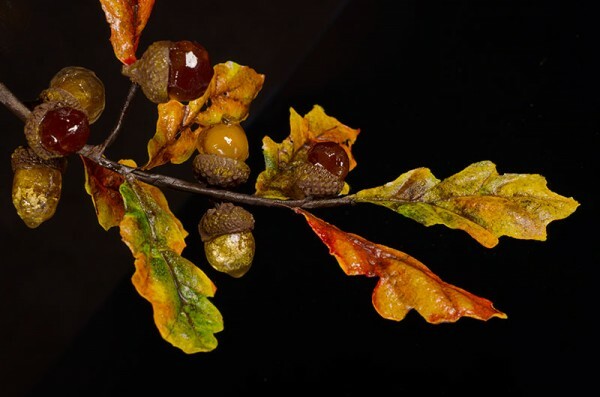 Acorns offer fun inspiration for autumn desserts, and this innovative tutorial by Lisa Berczel shows how to make isomalt acorns and wafer paper leaves! 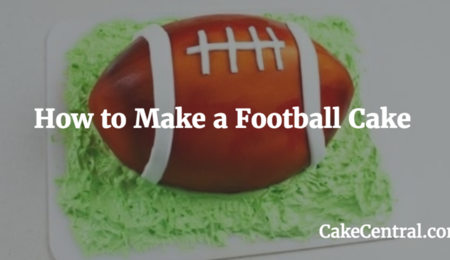 Looking for more ways to adorn dessert spreads this Thanksgiving? 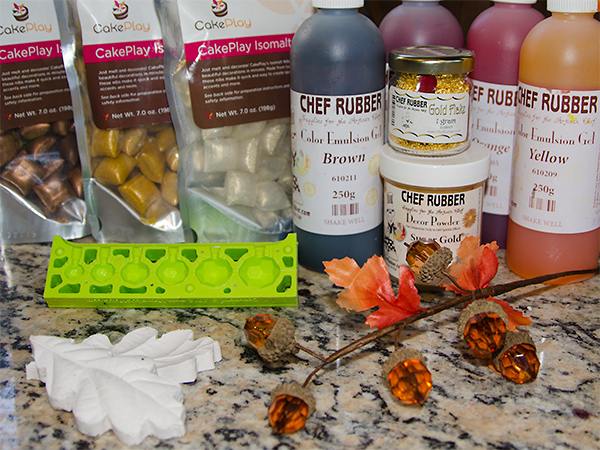 Check out these tutorials that show how to create Peanut Butter & Chocolate Acorn Truffles and Chocolate Candy Acorns! I love craft stores. I’ll wander isles just in hopes of hitting the creative lottery by stumbling across some unexpected inspiration. One of my recent wandering took me into the flower arranging section for no other reason than there was a 50% sale on the Autumn Seasonals. 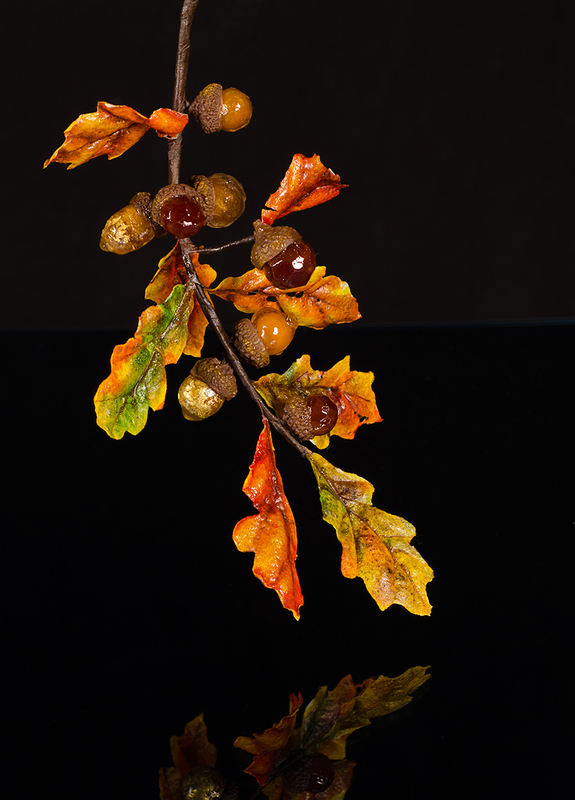 There I found a cute little oak branch that used beads for the acorn and could instantly “see” the branch made with isomalt and wafer paper… so I bought it. Chef Rubber Emulsion Jells, Colored Cocoa Butter, Gold Luster Dust & 24k gold flake, wafer paper & tylose. 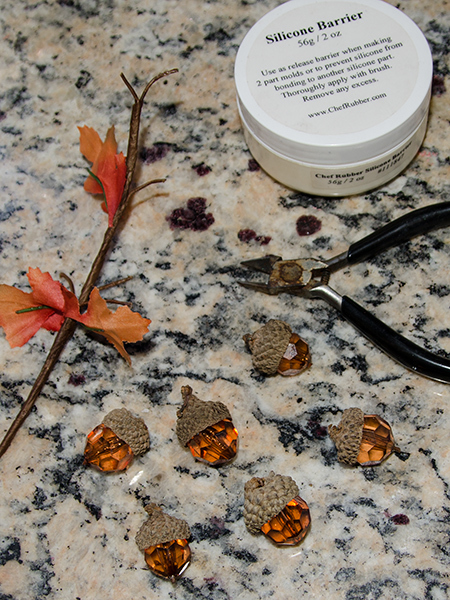 Once I got home, I rummaged through my studio and gathered everything I wanted to play with and set about planning what it would take to make my own acorn bead branch – including edible gold flakes. 1. The floral designers had already figured out patterns and assembly, so I just had to follow their road map. 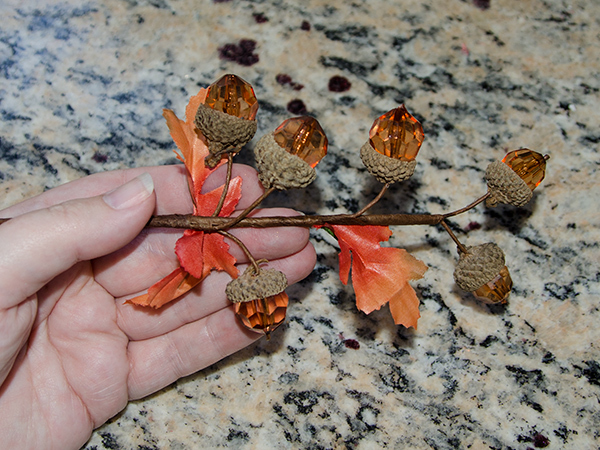 The branch used real acorn caps and I didn’t have a mold, so set about making my own. I cut apart my craft store find and painted a thin layer of silicone barrier on the caps and used a silicone putty to mold the caps. 2. I’d wanted to experiment with a tie-dye coloring idea for wafer paper, and bright fall foliage was the perfect thing to test on. 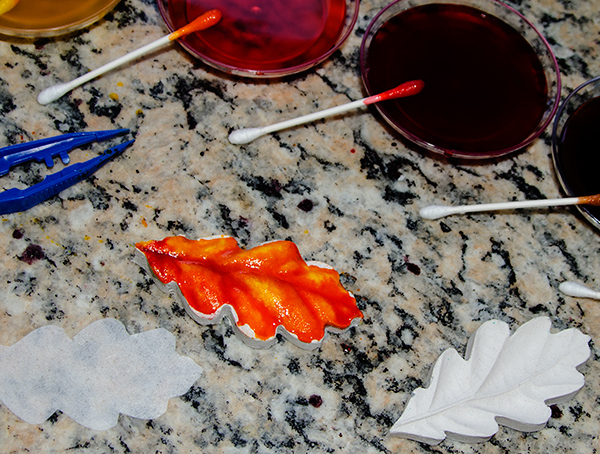 With my wafer paper leaf shape cut out and on ½ of my leaf mold, I swabbed on gel-color tined water and let different colors blend and pool in the mold grooves. 3. 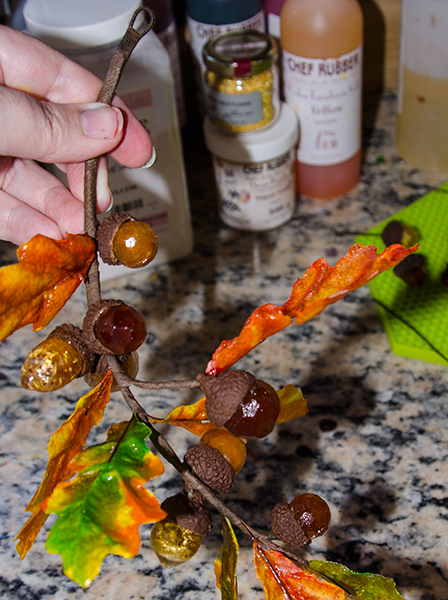 Once the wafer paper leaves were dry, I tested an edible glue I picked up at ICES to glue wire onto the leaves. The wires only went up about an inch or so from the leaf base. Next time, I’ll run the wire the whole length of the leaf so I can bend the leaf into different curves and shapes. 4. 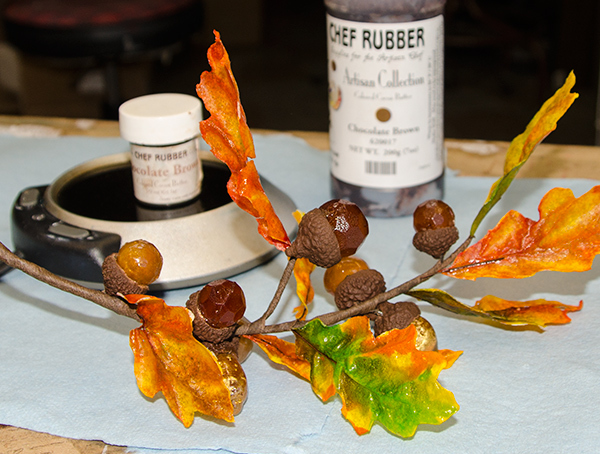 Next came the isomalt acorns. I cast some amber-colored beads and then experimented with some classic glassmaking techniques. I layered colored isomalt, gold luster dust, real gold flakes, and clear outer layers on an 18 guage floral wire base. 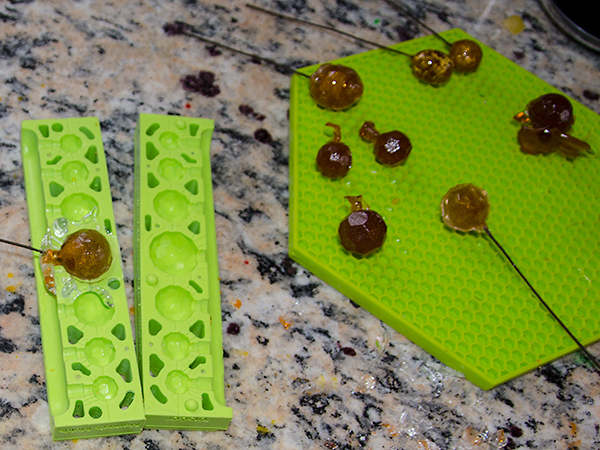 Some of the isomalt acorns I kept the smooth final surface. 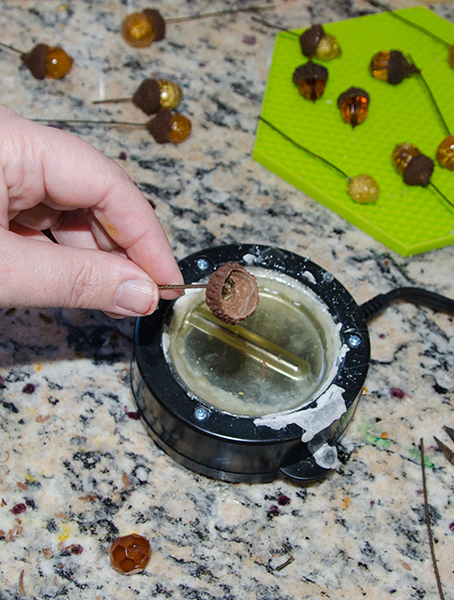 Some I experimented with using the bead mold to as a press mold to press the bead’s texture onto my acorn. I liked the result: a bead texture on the clear outside layer and golden center. 5. 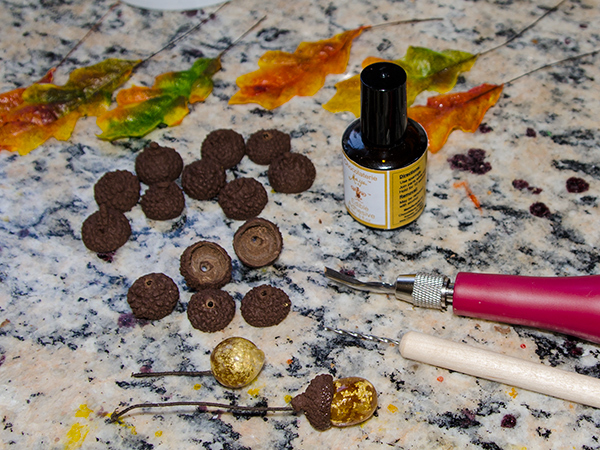 Acorn caps were molded with dark chocolate fondant (with tylose mixed in so my acorn caps would dry nice and hard). When the caps were good and dry, I used a clay hand drill to make a hole and block printing cutter to carve out the inside of the caps for the best fit with the acorn bodies. 6. 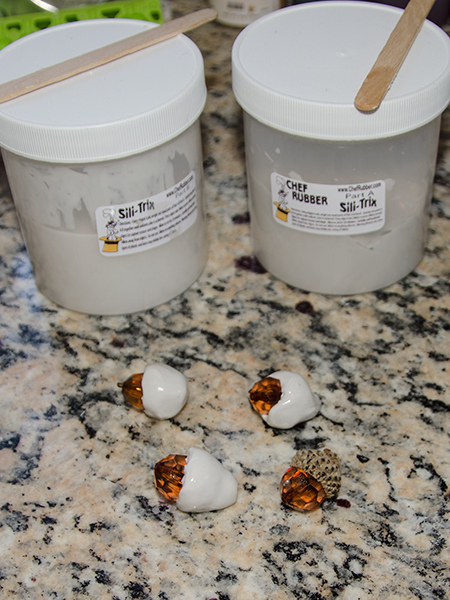 I used my isomalt “glue pot” to both both make the “glass” looking acorn bodies and to “glue” my caps to the cast beads. 7. All the individual elements were finished – it was time to assemble. 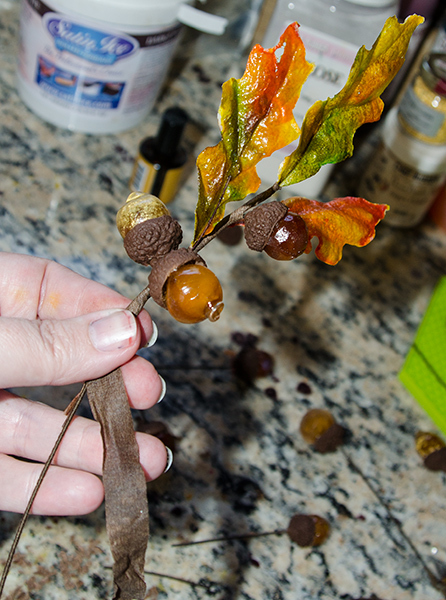 I used brown floral tape wrap leaves and acorn bundles, and even a short branch of a single leaf and acorn. At the end, I made a closed loop so it was easier to wrangle the final banch. 8. Colored cocoa butter was the final touch. I melted chocolate brown on coffee warmer and used a script liner brush to paint veins on the front and back of the leaves. I didn’t want to leave so much floral tape showing, so after I painted leaves I painted the branch, too. 9. 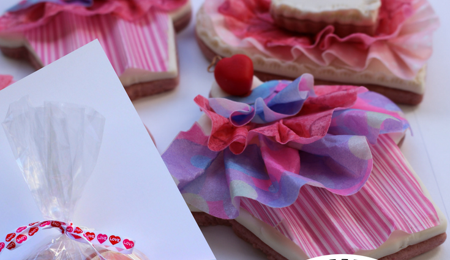 I hope my project shows how a little sideways thinking opens up endless possibilities for the Edible Artist. Thanks for all the inspiration and ideas. It looks beautiful. Job well done. 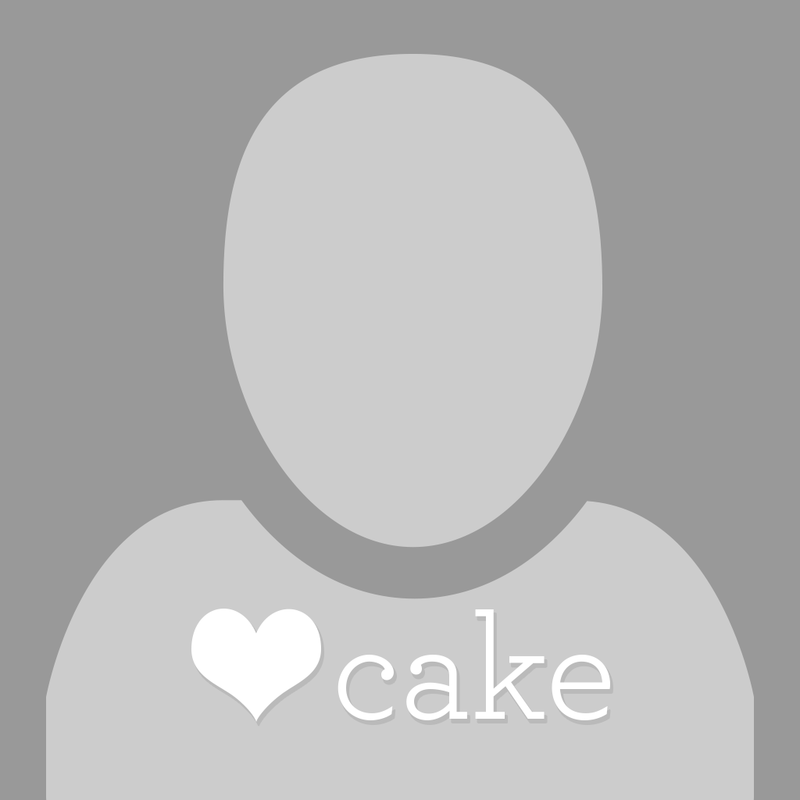 I hope to give some of your ideas a try. 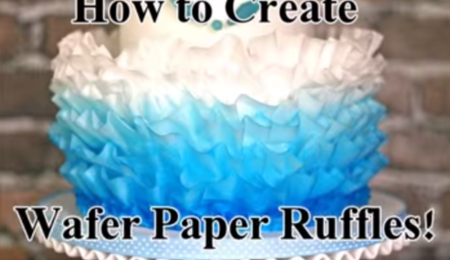 Like the wafer leaves. Cheers, Deb D.
That is a beautiful idea and an awesome finished product.